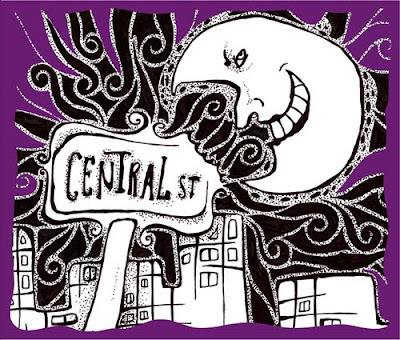 Here is a Bullfrog Brown's new CD, titled "Moon and central". I mention it because as you maybe notice you can't really see the albums title and the name of the artist on the front cover. We thought it is about time to make our version of "Smell the Glove". Less radically though - the necessary information is still available on the edge and also big and clear on the back side. The illustration is of course by yours truly. The purple color is a secret tribute to Deep Purple we all like so much :). 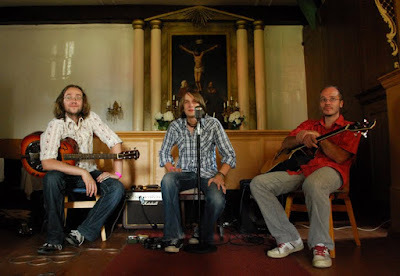 And really - I might have preferred to use a photo instead of drawing (though this one really fits the music) - but it is almost impossible to get those three to be at one picture - all acting and looking normal. Last time I tried Al made some truly sour faces... So there you have it. There are some songs from this CD available to listening in their myspace page.